Large rolls of paper can harbor many defects: smudges, bugs, crown core pieces, fragments of pulp or rubber, bits of paint, specs of dirt, and broken washer pieces trapped within the packaging. A producer of shrink-wrapped paper rolls reached out to machine vision system integrator Integro Technologies to develop a cost-effective, error-free inspection solution for finding flaws. Integro used machine vision to automate the inspection of paper rolls measuring approximately 2 m in diameter and 1.5 m in width. 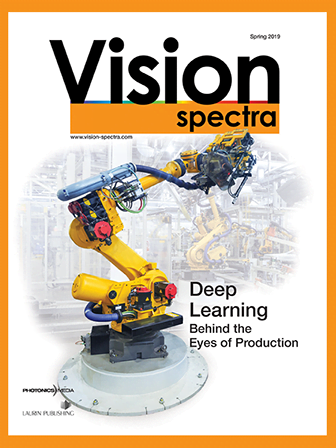 To ensure a seamless inspection process, Integro needed the machine vision system to meet two key goals. First, the system had to locate paper labels attached to the rolls and then read the associated linear barcode on the label, which contains information unique to each roll of paper. In addition to the barcode information and the color of the label, the system must identify text on the label by performing optical character recognition (OCR). OCR is the electronic recognition of printed or written text by a computer, and it can also perform functions like product tracking. A paper label and its associated barcode attached to a roll of paper. Courtesy of Teledyne DALSA. Second, the vision system had to detect any small debris that may have adhered to the outer portion of the paper roll or within the shrink-wrap material in which the paper is contained, to ensure that only the highest-quality products are delivered. Integro used a Piranha XL Multi-line CMOS TDI color camera and an Xtium-CLHS PX4 frame grabber, both from camera manufacturer Teledyne DALSA. Integro selected the camera because of its high speed, high data throughput, color requirements, and low-noise features. Additionally, the camera’s time delay integration (TDI) feature is useful for the vision inspection system because of the need for maximum sensitivity. TDI is a method of line scanning that permits greater scanning speeds in low light or at reduced lighting levels. It also allows for the accumulation of multiple exposures of the same moving object, making it ideal for high-speed web inspections. An inspected roll of paper ready for use by the consumer. Courtesy of Teledyne DALSA. To carry out the inspection process, whose cycle time averages two rolls per minute, the system triggers the inspection through the Xtium frame grabber from an encoder mounted to the shaft of one of the motor-driven rollers that rotate the rolls of paper below the camera. The sampling rate is 0.1222 mm per acquisition. As the rolls rotate, the Piranha XL color multiline camera acquires an image one line at a time to form a long image that is a linear representation of the outside surface of the roll. The vision system had to overcome several challenges. With an image size of 2.2 GB each, Integro had to develop unique image process capabilities to maintain reasonable inspection times. Furthermore, wrinkles in the packaging plastic wrap could cause false failures and therefore had to be handled in image processing. Inspection system. Courtesy of Teledyne DALSA. Another obstacle related to lighting. Integro needed to maintain a good and even source of illumination during the inspection process because of the variety in diameter of the rolls of paper being inspected. To resolve this issue, Integro installed a moving light bar controlled by a ball screw actuator. To carry out the inspection process, whose cycle time averages two rolls per minute, the system triggers the inspection through the Xtium frame grabber from an encoder mounted to the shaft of one of the motor-driven rollers that rotate the rolls of paper below the camera. The system has a distance sensor that helps determine the height of the roll of paper being inspected. Once this information has been obtained, the light bar is set to the correct position by adjusting the actuator to ensure the accurate inspection for the size of the paper roll. This allows a consistent distance at all times between the camera and the rolls being inspected. By automating the inspection of the paper rolls, Integro has enabled its customer to deliver high-quality products with a near 100 percent accuracy rate and eliminate the potential for errors caused by relying on human vision for high-speed inspections.